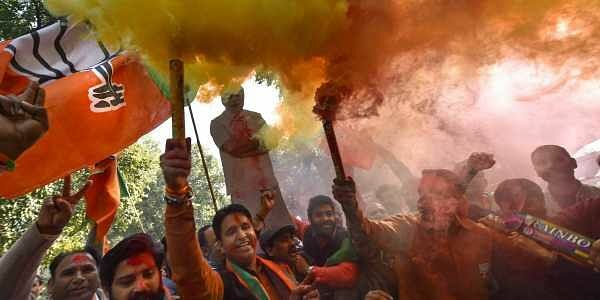 The Congress, which had won 61 seats in the previous elections, made handsome gains, adding 16 seats to its tally. AHMEDABAD: Surmounting the incumbency factor, attempted caste-based social engineering by the Congress, and perceived anger over the GST, the BJP clinched the Gujarat Assembly polls sixth time in a row today, winning 99 seats in the 182-member House. The saffron party's tally, however, was 16 less than 115 in the previous election. It is also for the first time it has slipped below the 100 mark since the BJP formed its maiden government on its own in 1995. It was in a coalition government with the Janata Dal in 1990 but the two parted ways soon. Modi, while addressing BJP workers in New Delhi accused the Congress of trying to sow the seeds of casteism in Gujarat in its "hunger for power", and claimed the victory in Gujarat and Himachal Pradesh underlined people's acceptance of his government's reforms. Prime Minister Narendra Modi hailed the party's victory in Gujarat _ where it has been continously in power since 1998 _ as "unprecedented", noting that retaining office was once considered a huge achievement in the country. Modi also said the win in Gujarat this time was not 'samanya' (normal) but 'asamanya' (special). He accused the Congress of promoting casteism in the eletions, and said there were "many forces at work" besides the opposition party to bring the BJP down. Congress president Rahul Gandhi said his party accepts the people's verdict in Gujarat and Himachal Pradesh, and thanked his party workers for fighting "anger with dignity" in the polls. "My Congress brothers and sisters, you have made me very proud. You are different than those you fought because you fought anger with dignity. You have demonstrated to everyone that the Congress' greatest strength is its decency and courage," he added. BJP chief Amit Shah, who together with Modi crafted the party's victory in their home state, refused to buy the claim that it was a keen contest. Shah said in New Delhi that though the BJP lost about 15 seats, its vote share rose by a little over 1 per cent to 49.1 per cent compared to the 2012 Assembly polls. The Congress's vote share also went up to 41.4 per cent--a two per cent increase. Though the number of seats won by the Congress and its vote share went up significantly with assistance from three young turks--Patidar, OBC and Dalit leaders Hardik Patel, Alpesh Thakor and Jignesh Mewani--it was not enough to unseat the BJP. The BJP's strong showing in cities like Ahmedabad, Surat and Rajkot, having large concentration of the trading community, could be seen as an endorsement of Modi's economic reform agenda. Finance Minister Arun Jaitley, who was the BJP's campaign incharge for Gujarat said there was certainly some concern in the party over the "misinformation" by the Congress over the Goods and Services Tax. "I am glad that in most of the trade areas the BJP has won and won convincingly," he said. Jaitley also accused the Congress of playing caste politics. "To defeat poisonous caste campaign is not easy but we defeated it." He said with a vote share of 49.1 per cent, the party could have won a two-third majority but votes did not necessarily translate into seats in elections. He said the BJP won a three-fourth majority in Uttar Pradesh with much less vote share. The victory in Gujarat has an added significance for the BJP as it was for the first time that Assembly elections were fought when Modi was not at the helm in the state. He, however, was still the face of the BJP's high-octane campaign. There were a few setbacks for the BJP on its way to triumph, with five of its ministers, including two of the Cabinet rank- Chimanbhai Saparia and Atmaram Parmar- losing. Significantly, the ruling BJP lost Unjha seat of Mehsana district, a constituency which includes Modi's hometown Vadnagar. A clutch of senior Congress leaders, including Shaktisinh Gohil, Arjun Modhvadia, Siddarth Patel and Tushar Chaudhary, also lost. Chief Minister Vijay Rupani retained the Rajkot West seat, defeating Congress' Indranil Rajyaguru by over 53,000 votes. Deputy Chief Minister Nitin Patel defeated Congress candidate Jivabhai Patel in Mehsana. Congress' Alpesh Thakor, the new OBC face in Gujarat, won from Radhanpur defeating Lavingji Thakor of the BJP. Dalit leader Jignesh Mevani won from Vadgam as an independent with the Congress' support. The BJP's tally of seats was the highest in the 2002 Assembly polls fought after the communal riots when the party had won 127 seats. It had clinched 121 in 1995, 117 in 1998, 117 in 2007 and 115 in 2012. The seat tally of 77 this time is the Congress' highest since 1995 when it had won 45 seats. The party clinched 53 seats in 1998, 51 in 2002, 59 in 2007 and 61 in 2012.